Columbia County was formed on December 17, 1852 from parts of Hempstead, Ouachita, and Lafayette counties. 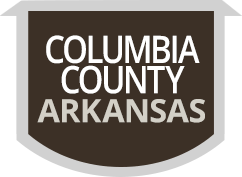 Columbia County is home to 24,552 people (according to the 2010 Census information) and is surrounded by the following Arkansas counties in the southwestern part of the state: Nevada County, Ouachita County, Union County, and Lafayette County. The county seat of Magnolia is appropriately named, due to the abundance of magnolia trees surrounding the courthouse. The offices and departments in Columbia County are located in the town square in Magnolia. Columbia County is made up of almost 800 square miles of beautiful landscapes, including Logoly State Park and Lake Columbia. Southern Arkansas University, a four-year accredited college, is located in Magnolia, Arkansas.